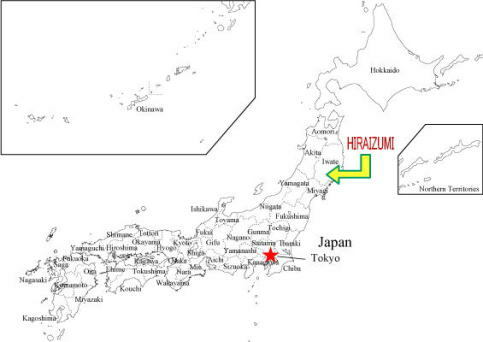 Hiraizumi is the place associated with Oshu Fujiwara Family who governed the Northeast of Japan in 12th century. After the war period, Kiyohira Fujiwara, the first lord of Oshu Fujiwara Family, built Chusonji Temple to make Hiraizumi as the paradise where Buddha lives. 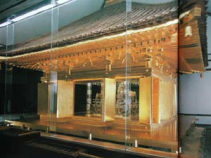 In the precinct there is Golden Hall which is the grave for first 4 leaders of Oshu Fujiwara. Other than this Chusonji Temple, Motsuji Temple, Mount Kinkei, Muryokoin Temple site and Kanjizaiouin Temple site are registered as world heritage. 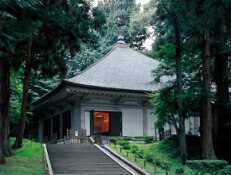 Chusonji Templewas founded by Kiyohira Fujiwara. This great monastery covers the whole area of Kanzan. Except Konjikido (Golden Hall) built in 1124, all other constructions of the period doesn't exist. But five later structures designated as Important Cultural Properties (the Sutra Repository, Former Konjikido Sheath Hall, stone Ganjojuin and Five-Tiered Shakuson'in Stupas, and outdoor Noh stage) and many original archeological sites remain well preserved. Konjikido (Golden Hall) is the only construction by Oshu Fujiwara. The hall is covered both inside and outside with gold leaf. The three alters decorated with gold, silver inlaid mother-of-pearl and makie (sprinkled picture with gold and silver), hold the mummified remains of the first three Fujiwara lords. It really is the symbol of the culture of Hiraizumi. It was constructed by second and third lords of Fujiwara Family. With the loss of its Fujiwara patrons, by the late pre-modern period Motsuji's original structures had completely burned down. But the temple itself continued uninterrupted. 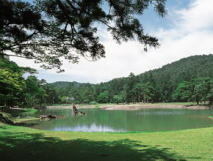 In addition to remains from the main temple complex, the Pure Land temple garden centered on Oizumi ga Ike Pond has been preserved, and restored based on archeological findings. Discovered during archeological excavations and restored to its original splendor. This feeder stream for the temple pond is known by its Japanese name, Yarimizu. This is the only extant feeder stream site from the 12th century, and the site of May’s elegant poetry event, Gokusui no En. Referred to as an artificial mountain, Kinkei’s peak is the site of a compound sutra mound created by Oshu Fujiwara. The remains of a hall dedicated to the deity Zao Gongen, the spirit of Mount Kimpu (near Nara), are believed located at the eastern foot of Kinkei, pointing to the mountain's association with the cult of Miroku (Boddhisattva). Kinkei is also known for legends of buried golden chicken statues and gold treasure. Built by 3rd lord Hidehira Fujiwara. Modeled after the famous Phoenix Hall of Byodoin Temple near Kyoto. After the fall of the Oshu Fujiwara, it was eventually burnt down. However, the archeological remains of its constructions and pond remain well preserved. Commissioned by 2nd lord Moritatsu Fujiwara’s wife. A prototypical Pure Land temple garden like that of its neighbor, Motsuji.